The office of Corporate and Community Education (CCE) is a comprehensive educational training resource serving MetroWest employers, individuals, and community agencies. New courses, trainings, certifications, and programs are continually developed and offered to meet the needs of our current and future students. Additionally, some of our programs end with certification or lead to enhanced preparation for national certification exams. CCE offers a wide variety of corporate and community education courses, programs, trainings, seminars, and workshops. Our staff specializes in designing customized programs to meet the specific training needs of area employers and residents. We are mobile and can train off-campus, as well as at any MassBay Community College locations in Ashland, Framingham, or Wellesley Hills. The CCE is dedicated to creating strong partnerships that lead to individual and employer success, and we welcome the opportunity to contribute to the growth and development of our MetroWest service area. CCE also helps individuals meet their professional development goals and needs. For individuals seeking to take their career to the next level, or in a different direction, we offer a wide variety of courses and programs for individual, professional advancement. We are excited to help people succeed and are highly responsive to the needs of our current and potential students. CCE has partnered with Ed2Go to offer online and hybrid courses, programs, and certifications. The number of courses offered in an online format is extensive. If your schedule does not allow time to train with us in person, you can now learn from the comfort of your own home or office. For more information about CCE, please contact us by email at cce@massbay.edu or call 508-270-4100 to speak with one of our friendly and knowledgeable staff members. Internships are a form of experiential learning that integrate knowledge and theory learned in the classroom with practical application and skills development in a professional setting. Internships give students the opportunity to gain valuable applied experience and make connections in the professional fields they are considering for career paths; and give employers the opportunity to guide and evaluate talent (National Association of Colleges and Employers, 2011, p.2). MassBay students have the opportunity to participate in credit (number of credit varies)/non-credit and required/elective internships. In order to participate in an internship, students must have completed at least 12 credits in their major and have a Grade Point Average of 2.0 or above. The Office of Career Services collaborates with MassBay faculty in guiding students through the process of finding and securing internships in their field of interest. For more information contact the Office of Career Services at 781-239-3142. Under certain circumstances, courses that are not on the course schedule may be available through directed study. Students and their instructor develop a contract for an individualized course of instruction for a directed study course. Learning communities link two or more courses with a common cohort of students, and often use integrated readings and assignments to explore a central theme. Students participating in learning communities have a stronger sense of belonging, increased engagement in their studies, and often achieve noteworthy academic success. MassBay has select opportunities for students to participate in a learning community, connecting students with different academic disciplines and to each other. Service learning encourages students to validate course concepts through engagement in activities that address community needs. Students gain practical experience while applying lessons learned in the classroom to real life situations. Students at MassBay can also participate in our Study Abroad Program to Costa Rica, which involves civic engagement by volunteer involvement in a specific project. In a service learning class, students deepen their understanding of classroom lessons by participating in a real-world project and reflecting on it in relation to the academic content of the course. Students are admitted to MassBay’s Honors courses based on academic achievement. Honors courses may include enhanced traditional courses, a seminar in advanced writing, independent study, or specially designed Honors Seminars. These courses enable students to study in small groups and to work independently with selected professors on intellectually challenging topics and projects while pursuing their degree or certificate. Alpha Beta Gamma, the National Business Honor Society, was established in 1970 to recognize and encourage scholarship among two-year-college students in business programs. Alpha Beta Gamma provides leadership opportunities and forums for the exchange of ideas, and promotes academic excellence. MassBay’s chapter of the Society is Kappa Epsilon. To be eligible, students must be enrolled in a business division program, have completed at least 15 credits, and have a cumulative GPA of 3.0. Alpha Kappa Lambda, MassBay’s chapter of the international honor society of two-year colleges, Phi Theta Kappa (PTK), was chartered at MassBay in 1984. The Society recognizes and encourages scholarship in the community and on campus by providing leadership opportunities and service experiences, and by offering an intellectual climate where members can exchange ideas and ideals, participate in a lively fellowship among scholars, and find encouragement for continuing academic excellence. In order to be inducted into PTK, students must have earned a GPA of 3.75 for 15-29 credits, or a GPA of 3.5 with 30 or more credits earned at MassBay. MassBay sponsors a chapter of Psi Beta, the National Psychology Honor Society. Students must have completed at least 12 semester hours, taken a minimum of three courses in psychology, have earned a grade of “B+” or better in each course, and have attained an overall grade point average of 3.5 to be eligible for membership. The biotechnology laboratory at MassBay’s Wellesley Hills campus are considered by industry and the National Science Foundation to be one of the most sophisticated undergraduate research facilities in the United States. It houses three A.S. degree programs: Biotechnology, Marine Biotechnology, and the only degree program in forensic DNA science in the world. The Biotechnology facility contains over $4.5 million of state-of-the-art equipment in which students, under the guidance of program faculty, train in cutting-edge research including analysis of gene regulation, DNA sequencing, genetic engineering, real-time polymerase chain reaction (RT-PCR), fluorescence microscopy, enzyme-linked immunosorbent assay (ELISA), bioreactor production of cellular molecules, mammalian cell culture and tissue engineering. Students in the Forensic DNA Science program are trained by their direct participation in actual criminal-, anthropological- and cold cases conducted with law enforcement or defense attorneys and use the most advanced mitochondrial DNA and allele analysis methodologies in the solving of these cases. The independent research projects conducted by students are global in nature and involve collaborations with academic and industry scientist worldwide. MassBay operates a state-of-the-art CAD laboratory equipped with industry standard software including: AutoCAD, Autodesk Revit Architecture, Pro/ENGINEER/Creo, SolidWorks, and MasterCAM, products. The CAD lab houses Rapid Prototyping and 3D Scanning Technology (uPrint/Dimension Printer and Next Engine Laser Scanner) and a professional-grade plotter. The engineering lab includes state-of-the-art instrumentation and measurement software such as Matlab to enable students to design, develop, program, and test novel engineering applications. The engineering lab also includes industry standard strength of materials testing equipment such as a Universal Testing Machine (UTM) and a torsion testing machine. The Electronics lab houses electronics industry standard software such as Cadence OrCAD and Matlab as well as electronic parts and tools that students use to experiment and create novel designs. The virtualized laboratory provides virtual access to multiple operating systems and network environments. The configuration of this lab allows running multiple courses in one semester, where each course requires different application and network resources in addition to a range of student administrative access to operating systems such as Windows and Linux. An additional dedicated laboratory currently features a dual-boot configuration so that both Windows and Linux operating systems are available. Dedicated laboratory rooms support the multimedia software required by our web-related and digital-imaging courses. MassBay Community College’s laboratories provide a comprehensive, hands-on learning environment for science students. MassBay labs feature a total of six 24-station general science laboratories dedicated to the study of biology, chemistry, anatomy, physiology, environmental sciences, and microbiology. Labs are well stocked with modern equipment and new digital technology to accommodate the learning needs of today’s students. Students seeking a degree within a science discipline or taking science courses as an elective will learn the fundamentals of chemistry and biosciences utilizing hands-on investigations, data visualization tools, and lifelike anatomical models. These tools help students deepen their understanding of scientific concepts, and inspire them to develop professional scientific skills. MassBay also offers students looking to further build on their laboratory experience a variety of higher-level science courses. Interested students may choose Organic Chemistry I & II, where they practice how to detect the presence of specific impurities and identify the presence of certain functional groups in a molecule using a state-of-the-art Fourier Transform Infrared (FTIR) system. Also offered is Molecular Biology, where students study the properties of organic and inorganic substances using the phenomena of fluorescence and phosphorescence with the aid of epi-fluorescent microscopes. MassBay also offers biochemistry and immunology courses that are enhanced by advanced laboratory components. This lab is housed on the fifth floor of the Wellesley Hills campus and is equipped with many sophisticated tools such as Gas Chromatography, UV/Visible Spectrophotometers, a DNA sequencer, advanced water and soil analysis systems, and many other microbiology-based pieces of equipment. The lab is used for teaching and for research and was used to discover a new, previously-undescribed bacterium, Bacillus samanii. The Nursing Lab on the Framingham campus for both associate degree and practical nursing students provides a state-of-the-art learning environment where students acquire psychomotor and physical skills necessary for direct patient care. Under the supervision of trained faculty and staff, students practice with human simulators, mannequins and health care equipment in a mock clinical setting. The Nursing Simulation Lab on the Framingham campus contains multi-functional human patient simulation equipment. The Human Patient Simulator, a programmable mannequin, can simulate hundreds of medical conditions, exhibit all physiologic functions, and respond in real-time to treatment and medication. The lab on the Framingham campus contains state-of-the-art equipment, a mock ambulance training center, the latest in monitoring and defibrillation equipment, ECG machines, a ratio of 2:1 intravenous practice mannequins, 3:1 ratio of intubation mannequins, and many other devices offering the latest technology to enhance student training. The Photography Imaging Laboratory on the Wellesley Hills campus houses digital and chemical darkroom facilities including enlargers for 35mm and 4”x5” film, a digital scanner, a printer and a personal computer. The Radiologic Lab on the Framingham campus is equipped with Radiologic Technology patient simulation, Computed Radiography (CR) equipment and a variety of both energized and non-energized x-ray equipment. This state-of-the-art laboratory provides an excellent learning environment to prepare for the actual clinical experiences provided in the program. The Surgical Technology Lab on the Framingham campus is a state-of-the-art operating room (OR) with OR tables, positioning equipment, an anesthesia machine, automated and manual blood pressure monitors and accessories. Many other devices, including mannequins and sterilizers, provide students with the technology and lab practice they require. The lab is also available to Central Processing Technology students. MassBay’s Academic Achievement Center (AAC) employs professional learning specialists and peer tutors across subjects. The AAC helps students with reading and study skills, writing for any class, and all levels of math and science. It also offers a range of services for students with disabilities. The Academic Achievement Center includes Disability Resources, Testing Services, Peer Tutoring, Online Tutoring, the Reading and Writing Center, and the Math and Science Center. The AAC is a warm and friendly environment where all MassBay students can receive assistance in achieving their academic goals. Request accommodations that will facilitate academic success. Finding mentoring and support opportunities. Disability Resources welcomes each student by providing an open academic environment that facilitates academic excellence. Offers students with intellectual disabilities, typically between 18-22 years of age, who may still be receiving special education services from their districts, the opportunity to participate in inclusive college courses (credit or non-credit) to increase their school and work success. New life skills that will assist students in their post-secondary interests and activities. Ability to function independently on the college campus. Self-determination skills in adult settings. Knowledge to request accommodations and other services at the college. The AAC provides testing services for make-up exams. Faculty members may arrange for a student who misses an exam for an approved reason to take a make-up test. Photo identification is required for all exams. All students new to MassBay and seeking a degree or certificate are required by the Massachusetts Board of Higher Education to complete placement testing soon after being accepted to the College. Placement tests determine the English and math classes in which students will begin their academic careers. Photo identification is required for all exams. The AAC offers a workshop series to help students prepare for the Accuplacer placement tests. These free, one-to-two hour workshops help students refresh their skills in arithmetic, algebra, reading, and writing. Please visit www.massbay.edu/placementworkshops for a list of upcoming workshops. The Peer Tutoring program offers free, student-based assistance in a wide range of subjects. Peer tutors excel in their areas of study and enjoy helping fellow students achieve academic success. Tutors’ goal is to help students become active, independent learners. Tutors use a variety of teaching techniques including questioning, modeling, listening, and demonstration. MassBay students can utilize a free online tutoring service, SMARTHINKING, from the MassBay Blackboard site. SMARTHINKING is available 24/7 and is used for many subjects. Citing sources in MLA or APA format. Both walk-ins and appointments are welcomed. No required appointments. Walk-ins only. Helping students identify other resources, including both online and print, as well as how to look questions up when learning specialists and instructors are not present. Connect students with individuals and resources on campus beyond their immediate faculty. The Academic and Transfer Advising Center is committed to assisting students in the development of meaningful academic plans that are compatible with their professional and life goals. Academic Advisors guide students from their first contact with the College through graduation and beyond. We introduce incoming students to the opportunities and resources of the College, inform new and returning students of the requirements of academic programs, assist students with the selection of a major and the appropriate courses to ensure academic success, and counsel students regarding transfer opportunities. All registered degree/certificate seeking students are assigned an academic advisor who may be a member of the faculty, professional staff or an academic advisor in the Academic and Transfer Advising Center. The name and contact information for one’s advisor is available on the Student Center page of Bay Navigator. Advisor assignments are generally made after the add/drop period in the fall and spring semesters. 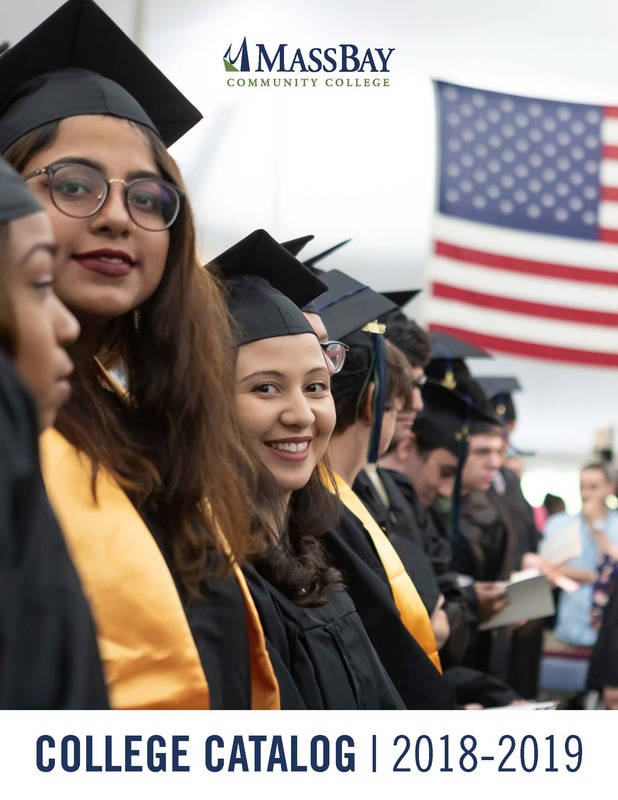 MassBay Community College adopted the standards set forth in the Common Transfer Policy drafted by the Department of Higher Education. The purpose of this policy is to ease and clarify the process of transferring earned credit from one college to another, while providing common guidelines for institutions to adhere to. To view the Common Transfer Policy in its entirety, view the Department of Higher Education website at www.mass.edu. For credit to transfer, the courses must have been taken at an institution accredited by one of the six regional accreditation agencies in the United States. Credit from institutions with national accreditation, recognized by the Council for Higher Education Accreditation (CHEA) may be used for specific career oriented programs. MassBay Community College requires official transcripts from the institutions where credit was earned in order to transfer. Students must be accepted by MassBay Community College and declared their program of study for credit to be transferred and applied accordingly. At minimum credit will be granted for courses that apply to students’ current programs of study. Once credit is transferred it becomes part of students’ permanent records. Only credit for course work deemed college-level upon evaluation will transfer. Credit for pre-college-level or developmental coursework does not transfer. MassBay Community College does not use external developmental coursework for student placement purposes. Grades do not transfer; only credit transfers. Therefore, transfer credit grades are not used in calculating grade or quality point averages. Transfer credit is designated on transcripts with the designation of “T”. The “T” grade is defined as transfer credit from an external institution. Credit will transfer as (1) the course equivalent (if it exists), (2) as an elective equivalent within a comparable department, or (3) with an appropriate transfer code and number, when neither the course equivalent, nor a comparable department, exists. Credits earned in a quarter-hour system will be converted to semester-hour equivalents. Audited coursework does not transfer. Credit will not be granted for duplicate coursework or for two courses that cover the same or similar content. MassBay requires a minimum grade of C- (1.70 on a 4.00 scale) or higher for courses and credits to transfer. Restricted programs in addition to specific academic programs and courses may require a grade higher than C- for grade to transfer. Review curriculum sheets and course descriptions for this information. Grades of D, D+, C- and CD (1.00 to 1.99 on a 4.00 scale) may transfer if they are for courses that are part of the 34-credit MassTransfer Block and students have completed the Block with a cumulative grade or quality point average of 2.00 or higher. This notation must clearly be indicated on the official transcript from the sending institution. Grades higher than C- (2.00) may be required for admission or transfer into certain programs, for use as pre-requisite courses and for application of credit to certain program requirements. Grades of Pass (P), Satisfactory (S) or similar grades will transfer only when official transcripts indicate that such grades are equivalent to a grade of C- or higher. MassBay requires students to complete at least one quarter (25%) of the credits of the first associate degree or certificate in order to graduate (referred to as the residency requirement). Transfer of up to the remaining three-quarters of the credits will depend upon the program’s requirements and elective options. Students must complete 15 separate academic credits to obtain a second associate degree at the college. Official score reports from the College Board (or other entities) are required in order to receive credit for AP and CLEP. Credit will be granted for satisfactory scores on challenge or credit examinations only if satisfactory is defined as C- or higher on official transcripts or official score reports. Credit may be granted for formal courses or examinations offered by various organizations, including businesses, unions, government and military based on the recommendations of the American Council on Education (ACE) as found in its National Guide to College Credit for Workforce Training, a resource of its College Credit Recommendation Service (CREDIT). Credit also may be granted for learning from experience at work, volunteering in the community, military service, job training, independent reading, open source courseware study, and hobbies based on the Prior Learning Assessment (PLA) standards of the Council for Adult and Experiential Learning (CAEL). Members of the Servicemembers Opportunity Colleges (SOC) Consortium adhere to the Consortium’s Academic Residency Requirements for service members at their institutions. Academic credits earned through the evaluation of military occupation, training, experience and coursework are transferable within the Massachusetts public higher education system in accordance with the Mass Transfer agreement. Credit granted by one institution from alternative sources other than that included by item H above may not transfer to another institution. Credit will be transferred without time limits in most cases. MassBay reserves the right to refuse recognition of courses completed more than ten years prior to the date a student applies for transfer. Science and Computer courses must have been taken within the last 5 years in order to transfer into MassBay. Certain programs, courses or admission standards may require courses to be taken within a specified time period. A student wishing to challenge course credits accepted by MassBay from another institution must complete a Transfer Credit Appeal Form located in the Academic and Transfer Advising Center. The transcript will be reevaluated by a separate Academic Advisor who will consult with pertinent Faculty, Department Chairs, and/or Academic Deans. Students should provide additional documentation including course descriptions and/or course syllabi with their appeal form. The student will be notified via letter to the address on file with the College of the results of the appeal. Final decisions regarding the awarding of transfer credit from MassBay are made by the receiving institution. Students are encouraged to bring their concerns regarding the awarding of credit to the receiving institution. Students may consult with MassBay’s Coordinator of Transfer Affairs & Articulation regarding their concerns, and the Coordinator may contact the receiving institution on the student’s behalf for further clarification when applicable. MassBay’s Transfer Advisor will assist the student by reviewing the appeal and meeting with the student. The Transfer Counselor may contact the receiving institution on the student’s behalf for further clarification. MassBay will designate and publish the contact information of an ombudsperson that ensures institutional compliance with transfer policies and procedures. MassBay will periodically review this policy and propose amendments with the consideration of the Department of Higher Education. The Department of Higher Education Common Transfer Policy may be amended with the unanimous consent of the community colleges. Questions and comments regarding the Common Transfer Policy may be sent to the Department of Higher Education. For contact information visit : www.mass.edu. Students must be accepted to the college and have a declared major (degree or certificate program). Request an official (in a sealed envelope) transcript from the registrars of all institutions, or the military, that a student previously attended for which they wish to transfer credit. Or, students may deliver transcripts in the sealed envelope to either the Wellesley Hills or Framingham campus at the Office of the Registrar. Students should submit official transcript(s) at least six (6) weeks prior to the time that they wish to register for upcoming classes to ensure credit is evaluated and posted prior to registration. Once courses have been officially approved and transferred, they will appear on a student’s MassBay transcript. Students will also receive a letter from the Advising Center informing them as to which of their courses transferred in. In accordance with the VALOR Act, Massachusetts Bay Community College evaluates credit earned for military education, training, experience, or coursework using the same standards as those applied to coursework from accredited colleges and universities. MassBay reviews all military transcripts and discharge documents (DD214), including SMART, ACE, and AARTS, as well as CLEP and DANTES Subject Standardized Tests in accordance with college policies for transferability of credit to the student’s intended major or program of study. Such evaluation shall be in accordance with existing Mass Transfer agreement policies. Students shall receive accurate and complete academic counseling from the Veterans’ Coordinator in collaboration with the Academic Advising Center. MassBay Community College is committed to assisting students in furthering their education beyond the Associate Degree. Transfer Advising (located in the Office of Academic Advising) has resources to assist students in making informed choices about their academic plan in order to make a smooth transition to a 4-year institution. Transfer Workshops are held throughout the year on the Wellesley Hills and Framingham campuses. These workshops present an overview of the transfer process and provide students an opportunity to meet the transfer coordinator. These workshops are designed to answer some of the ‘big picture’ questions about transferring into a four-year institution. All students interested in transferring to another school should attend a Transfer Workshop early in their academic career at MassBay. There is a Transfer Fair in both the fall and spring semesters of each academic year. Over 35 colleges and universities are invited to attend the transfer fairs each semester. At the fair, students have the opportunity to meet with admissions representatives about the requirements for transferring into the school. The transfer fair is also a great time to learn more about the institutions that you are interested in applying to after your time at MassBay. The transfer coordinator is available by appointment to meet with students who have already attended a Transfer Workshop. The transfer coordinator assists students in navigating the transfer process and other academic planning needs. Every four-year public institution (state universities and UMass campuses) has a different set of general education requirements. The MassTransfer Block refers to a set of general education, core, or distribution requirements, consisting of 34 college-level credits. These credits, when completed together with a 2.0 or higher GPA, fully transfer to any Massachusetts public higher education institution…even if you don’t have your associate degree. These credits also satisfy general education/distribution/core requirements at any other Massachusetts public higher education institution, with the receiving institution being able to add no more than six additional credits/two courses. Anthropology (AN), Economics (EC), Geography (GG), Government (GV), History (HS), Law (LA), Psychology (PS), Sociology (SO). Art (AR), Communication (CO), Critical Thinking (CT), French (FR), Humanities (HU), Literature (LI), Music (MU), Philosophy (PH), Photography (PO), Speech/Theater/Film (SF), (SL), Spanish (SP). Biology (BI), Chemistry (CH), Environmental Sciences & Safety (EV), Physics (PY), Science (SC), Nutrition (NS). Associate degrees approved in MassTransfer include the MassTransfer Block. The remaining credits in the program have been reviewed by four-year public institutions to ensure transferability. No admission fee or essay. Transfer of 60 credits applied to the bachelor’s degree. Automatic satisfaction of the general education requirements at the receiving institution. All of the above benefits, plus guaranteed admission. All of the above benefits, plus a 33% tuition waiver. Select institutions replace with All of the above benefits, plus a 100% tuition waiver (some exclusions apply). Not all programs at community colleges will qualify for MassTransfer since many programs don’t have the appropriate courses to satisfy the MassTransfer Block requirement. To address these concerns the MassTransfer ATA agreement has been created. Programs approved through the MassTransfer ATA program still receive all of the benefits listed above in the traditional MassTransfer program, however, students will not receive the general education waiver. Four-year public institutions will only approve programs through MassTransfer ATA when a student transfers 60 or more credits. The Education Compact has been moved under the MassTransfer Program. This compact is specifically for Elementary Education and Early Childhood Education majors at MassBay. The compact ensures that students are completing Massachusetts Department of Education course requirements to teach in their selected fields. Students must take and pass the MTEL licensure exam before transferring. Students will receive all of the benefits listed in the traditional MassTransfer program.